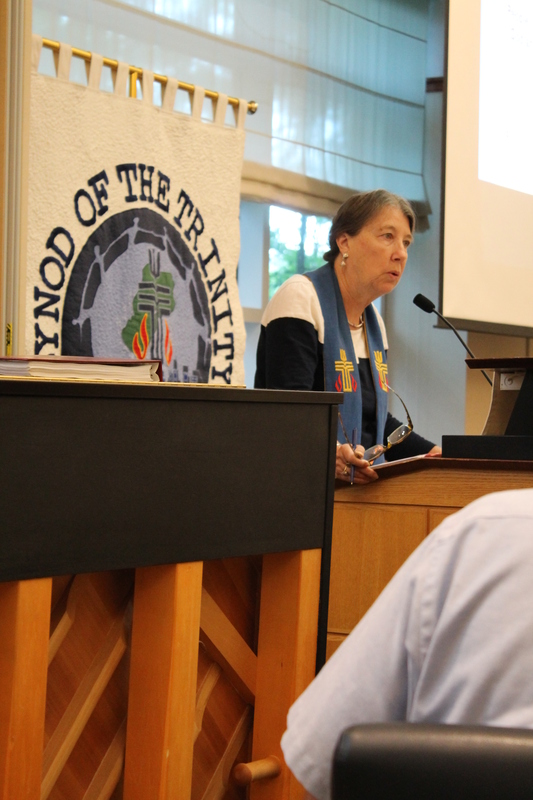 What follows are the opening remarks made by Synod of the Trinity Moderator Barbara Chaapel at the Synod’s Assembly Meeting on June 22. We come today with heavy hearts and disturbed minds in the wake of the violence and death in Charleston. That violent act, a sign of the conflict and hatred in our society, took place within the walls of a church. And at a time when Christians were at prayer and studying God’s Word, as we will pray and study God’s word at this Synod gathering. The violence is ours, as is the hatred and the death. Jesus tells us in scripture that we are in the world, but not of the world. We must determine how to live that out. We, even the church, are part of this world of violence and hatred. Yet we as followers of Christ are not fully of that world. We follow a different path, the path of love. How do we live as followers of that path in a world where these acts are our present reality? Racism is real and pervasive, as witnessed by the racially-motivated murders at Emmanuel AME church. The highest court in our land considers this week the legality of marriage, and thus full inclusion, for gay people, including gay Christians. That same court will soon decide the legality of the first national healthcare plan in our history, and if it is not upheld, will exclude many who cannot afford care. A candidate for the highest office in our land says, in response to the Pope’s encyclical about the need for environmental justice, that the head of his own faith tradition should not mix politics with faith, that political decisions have nothing to do with faith. Another candidate for president says that Mexicans crossing the border are criminals and rapists. The gap between rich and poor is ever-widening. Police cannot be trusted by some citizens to protect them, but rather are feared as perpetrators of violence. This is the world we are living in, the nation we are citizens of. We must pray, yes. And I ask that this whole meeting be one prayer. But a prayer is not enough. It is too easily said and dismissed, back to our business as usual, satisfied that we have said something appropriate. We are gathering to talk about vision, a vision for this Synod and for our congregations and presbyteries. We must begin by talking together honestly, being open to hearing each other’s pain, and most importantly, using our God-given creativity to take action, one step at a time. This is an opportunity for us to be a transformative people. Later in this meeting, we will take time to hear each other’s pain, to talk openly about racism in our country and in our churches. To think together creatively about answers — the more than one “right answers” to the serious problems that face us. And to begin to take steps to break old patterns and form new solutions in our common life. And when we leave here to return home, we will leave nine empty chairs that will continue to hold us fast to the actions we commit ourselves to.